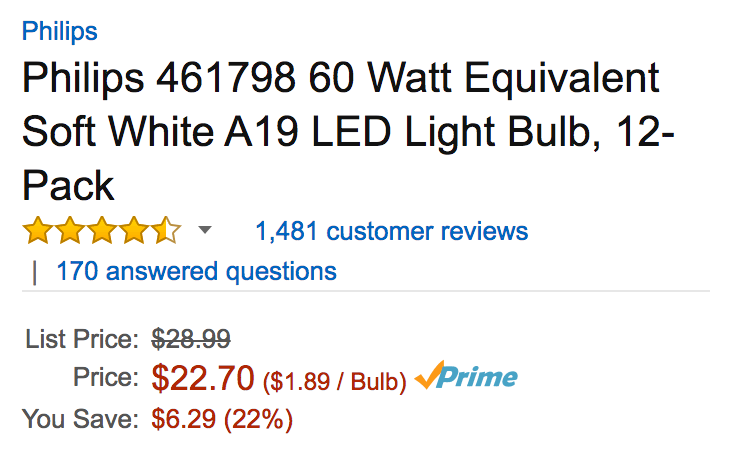 Amazon offers a 12-pack of Philips A19 Soft White LED Light Bulbs for $23.23 Prime shipped. For comparison, this bundle usually goes for around $29+ and today’s deal is an Amazon all-time low. Rated 4.5/5 stars by over 1,400 reviewers. These bulbs are rated for just $62 of energy consumption over its 10+ year lifespan, consuming just 11 cents/kWh. Saving money on quality lighting doesn’t need to be expensive. With the familiar look and feel of traditional bulbs, Philips LED light bulbs are the smart and affordable alternative to the standard incandescent. Philips LED light bulbs are designed with the customer in mind. We do this by combining our understanding of people with our expertise on technology and design – knowledge gathered over 120 years. We deliver what matters the most to you, based on validated insights in the market. Our products are built to last, with unbeatable quality.